1. Signature Horizon is located at the hilltop on Dollar Hills, in an area that is one of the fastest growing development hotspot in Hyderabad. It’s closely connected to the ORR, and is very close to the posh areas of Jubilee Hills, Banjara Hills, Gachibowli, Financial district and the popular Hyderabad Golf Club. 2. Signature Horizon is an address with a view as it the only apartment complex on Dollar Hills with unmatched and uninterrupted views of the city and two of its most recognizable monuments and is a stone throw away from these historical monuments (Golconda Fort and Qutb Shahi Tombs). 3. Architecturally it’s a modern wonder, designed to perfection by the acclaimed architects Morphogenesis. It has been conceived such that its ground floor begins where the roof tops of the neighboring majestic villas end. This means that no building will obstruct the views and will give the residents at Signature Horizon an experience of living in the sky! 4. The amenities being provided at Signature Horizon are un-matched. A boutique apartment complex with just 82 select residences, it offers the complete range of amenities that are normally reserved for larger complexes. This means that living at Signature Horizon is actually like having your own private retreat 365 days a year, complete with your home, family and the full range of sporting, recreational and conveniences. 5. The eleven towers at Signature Horizon are thoughtfully planned, with one apartment on each level, which means that you do not share walls with another home and enjoy complete privacy. These homes are connected with a corridor which runs all along, overlooking the social hub of the complex, the central courtyard. The way each tower is planned and spaced, you are ensured of natural ventilation and light through the day. 6. Often as a buyer of an apartment, you have to compromise of various Vastu principles. With Signature Horizon, we have made sure that the perfect square shaped apartments, set on a near square land parcel, comply with all the main Vastu requirements, resulting in happy and prosperous homes for you. 7. As a buyer, you have the unique offer from the developers – the freedom to change the floor plan of your apartment during the construction stage, only keeping the bathrooms and kitchens intact for Vaastu and plumbing compliances. This means that you can modify the internal layout as per your requirements and with ease. 8. Our launch invitation price is Rs 6500 per sq. ft. This means good returns for you as the developers intend to increase the price by 10% every 6 months until completion. 9. The best talent available has been put together for the best of quality and timely delivery of Signature Horizon. Be it the structural engineers; mechanical, electrical and plumbing engineers; landscapists – the best teams are at work relentlessly to give you the desired finished product. 10. Signature Developers has the strong credentials of setting standards in luxury, quality and delivery with their completed project Signature One at Banjara Hills. 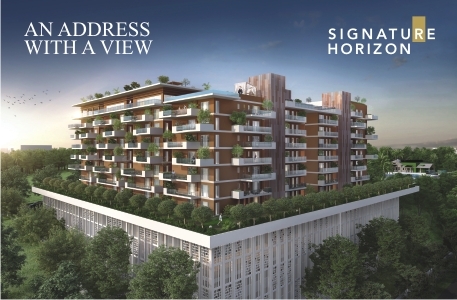 With Signature Horizon you will get the same standards and best in class lifestyle.